The Hyundai Santa Fe is getting a slight refresh this model year, adding even more terrific features and amenities to the SUV that saw a full redesign two years earlier. The Santa Fe is one of the most popular models on Hyundai's line and the winner of several accolades that have called out its many impressive qualities. 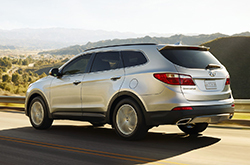 Shoppers can choose between two Santa Fe models: the Santa Fe and the Santa Fe Sport. The base Santa Fe model comes in two trim levels: SE and Limited. The SE trim starts things off with 18-inch alloy wheels, a rearview camera, heated side mirrors, a chrome accent grille, chrome door handles, projector headlights with LED accents, daytime running lights, heated front seats, stain-resistant cloth upholstery and a 4.3-inch color touchscreen. The 2016 Hyundai Santa Fe Limited in Carrollton adds an electroluminescent gauge cluster, an auto-dimming rearview mirror, leather upholstery, dual front automatic climate control, proximity key entry and push button start, and a hand-free liftgate. The Santa Fe Sport model also comes in two trim levels: Sport and Sport 2.0T. Both trims come with similar features as the regular Santa Fe, but add more sport features like more room for cargo, a tighter turning radius and a firmer suspension. Four optional packages are available on the base Sport model: Popular, Premium, Tech and Ultimate. Our 2016 Hyundai Santa Fe review recommends choosing the Tech or Ultimate package for the most luxury features, including xenon headlights and ventilated front seats. Under the hood, the regular Santa Fe is powered by a 3.3-liter V6 engine that rates at 290 horsepower and 252 lb.-ft. of torque, while the Santa Fe Sport runs on a 2.4-liter inline four-cylinder engine that rates at 190 horsepower and 181 lb.-ft. of torque. Both engines are paired with a 6-speed automatic transmission with SHIFTTRONIC and an active ECO system. 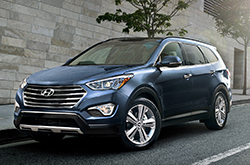 To take the 2016 Hyundai Santa Fe in Carrollton for a test drive, stop by Van Hyundai today. To see more features on the Santa Fe, as well as a video review, keep reading our 2016 Hyundai Santa Fe review below. 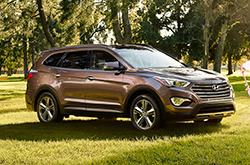 Compare Hyundai's newest model of the Santa Fe to its rivals and we're sure that you'll choose it over vehicles like the 2016 Ford Explorer, Chevy Equinox, Kia Sorento, Toyota RAV4 and the Honda CR-V. Just a few of the attributes that shoppers in TX will benefit from are the Santa Fe's handsome styling and budget-friendly price. 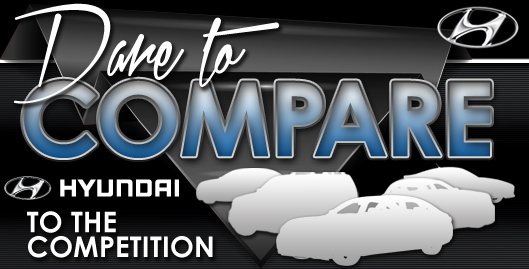 You'll surely see it's a truly amazing value when you compare its price to competing vehicles. Find out more - Take a look at the bullets under this text! For reviews of the 2016 Hyundai Santa Fe and earlier models, Van Hyundai is your trusted resource. Our reviews are recorded by well-informed automotive critics. It is a resource we like to provide as one of Carrollton's premier Hyundai dealers. The above article is bundled with accessible data - it contains info about safety features and other specs so that you can make intelligent decisions about the Hyundai you want to buy. Thank you for reading over Van Hyundai's 2016 Santa Fe review. Now that you know more about the Santa Fe, message us to learn about current lease offers and incentives that can help you save a substantial amount on your purchase.